The film is a sci-fi short and it sounds like it'll be a very physical undertaking. Jessica and her actors have been doing stunt-training for months (video above) and taking archery lessons at a park in Los Angeles where we shot our interview with her for EPIC FU. The shoot for AE will take place on location in the U.S. and will have significant crew. For all intents and purposes, it will indeed have all the quality and potential problems of a studio-level short film. Jessica, who started out as the host of an international teen show on AOL, is very realistic about the difficulties of making the movie. She has all of her own money invested because she feels that if you're going to ask other people for their hard-earned money to make her project, they better believe that she's as invested as they are. The latest tally has her at $40,000 of the total $150,000 needed for the film. 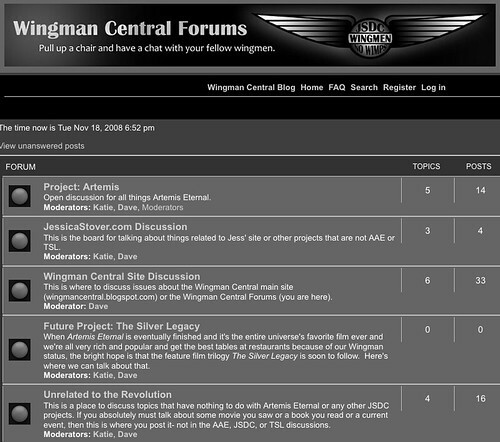 The "Wingmen" are the contributors to the project, and they are a very passionate group. They send in videos and started their own forum to stay abreast of everything related to the movie and to Jessica. To keep all the latest info at their fingertips, there's a link to the Wingman Briefing Room at the bottom of the Artemis Eternal home page. As the site says, there are many ways to be a Wingman beyond contributing money. You can help spread the word, too. Go to artemiseternal.com for all the info and to support Jessica's film if you can!